An easy and filling dinner-this beefy bean burrito has all the fixings for a great Mexican fiesta!! In large skillet cook ground beef until brown, drain and return to pan-add tomatoes, chili powder, garlic and cumin. Cook for about 2 minutes blending together well. 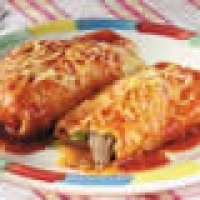 Fill each tortilla with a layer of refried beans, a sprinkling of green chiles, a heaping tablespoon of tomato sauce and a small portion of ground beef. Roll up, burrito style and place seam side down in a 9x13 baking dish. When tortillas are filled sprinkle with Mont. Jack Cheese. Bake for 20 minutes or until the cheese is bubbly. Serve immediately with shredded lettuce, mashed avocados, sour cream and black olives. This looks great thanks so much for sharing! Love Mexican food, and Burritos are at the top of my list. Buy them all the time at Sam's, sometimes I make them, this is a great post. Thanks for sharing, delish! Like jlophoenixrising's recipes? Never miss an upload!